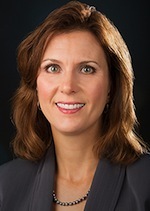 Tracie Sharp, president of the State Policy Network (SPN) since January 2000, had previously served on its board of directors for 14 years (see the State Policy Network article for more). She was the executive director and one of the founders of Cascade Policy Institute, Oregon's market-oriented think tank, from 1991 to 1999. She worked in the areas of education and social security privatization. This article is a breakout of the State Policy Network article. Please see State Policy Network for more. Although many SPN groups claim to be independent and non-partisan, they promote a policy agenda -- including union-busting, attacks on the tort bar, and voter suppression -- that is highly-partisan and electoral in nature. Sharp told the Wall Street Journal after Donald Trump's victory at the polls in 2016, "We feel like for such a time as this, we've built up this network. We need to really run. This is a state moment." Sharp celebrated Trump wins in traditionally blue, labor-friendly states like Wisconsin, Michigan and Indian, claiming that anti-union law changes pushed by SPN members and ALEC politicians in those states flipped them from blue to red between 2008 and 2016. She said she felt that Wisconsin and Michigan were only "thinly blue," and that the GOP has been put on better footing by the unions' slide: "When you chip away at one of the power sources that also does a lot of get-out-the-vote," she says, "I think that helps -- for sure." In 2012, a list of 2010 funders of an SPN member think tank in Texas, the Texas Public Policy Foundation (TPPF), that was disclosed to the IRS was inadvertently made public. The list of funders revealed is an important case study in how SPN's member think tanks are funded, and by whom. Koch Industries, for example, gave $159,834 directly to TPPF, in addition to $69,788.61 from the Claude R. Lambe Foundation, which is a Koch Family Foundation. SPN itself gave TPPF $49,306.90, but what's more, Tracie Sharp, SPN's executive director, was the contact person for an additional $495,000. These two grants, for $300,000 and $195,000, were listed as being received from the "State Think Tank Fund" and the "Government Transparency Fund," respectively -- two funds about which virtually nothing is known. Many SPN groups focus on destroying unions -- most notably the Freedom Foundation in Washington State and the Mackinac Center for Public Policy in Michigan. These two institutions provide training and leadership for the entire SPN network. "There's no doubt that with the decline in union membership here in Wisconsin, the political clout of the union bosses and their ability to automatically turn out members for Democrats has declined dramatically,' Brett Healy, president of the Bradley-funded MacIver Institute (SPN member group), told the Heritage Foundation's Daily Signal. "'Did the labor reforms enacted in Wisconsin and neighboring Michigan help Donald Trump win those states?' asked Matt Patterson, executive director of the Center for Worker Freedom at Grover Norquist's Americans for Tax Reform (SPN member group). 'No question in my mind. Hard to fight when your bazooka's been replaced by a squirt gun.'" Sharp represents SPN as a member of the American Legislative Exchange Council (ALEC). She is a member of ALEC's Education Task Force and Health and Human Services Task Force. 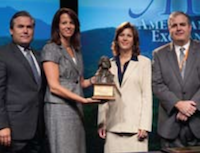 She was the recipient of ALEC's 2009 Private Sector Member of the Year Award. Sharp is also a trustee to the Roe Foundation of Greenville, South Carolina, the foundation endowed by South Carolina hardware store millionaire and SPN founder Thomas A. Roe, and to the Special Hope Foundation, a "family foundation supporting innovative projects to assist the causes of the physically, emotionally, and developmentally disabled," a biographical note on the SPN website states. In 1993, Sharp founded HOPE-Oregon, a Portland, Oregon-based "private volunteer effort to provide health care education services to low-income families." According to SPN, "Previously, Ms. Sharp worked with Washington State radio commentator and Republican Party leader John Carlson as director of programs at the Washington Institute for Policy Studies in Seattle." ↑ 2.0 2.1 2.2 Kyle Peterson, The Spoils of the Republican State Conquest, Wall Street Journal, December 9, 2016, archived by CMD here. ↑ Forrest Wilder, Revealed: The Corporations and Billionaires that Fund the Texas Public Policy Foundation, TPPF Donor List, Texas Observer, August 24, 2012. ↑ Rebekah Wilce, State Policy Network: Writing ALEC Bills and SPNing Disinformation in the States, PRWatch.org, April 2013. ↑ 5.0 5.1 Mary Bottari, Center for Media and Democracy, Bradley Foundation Bankrolls Attacks on Unions, PRWatch, May 8, 2017. ↑ American Legislative Exchange Council, ALEC Announces 2009 Award Recipients (sub. req'd. ), organizational press release, July 24, 2009.